Implementing new technology that solves real problems is great. It is exciting, and you get to stand on the shoulders of the smart folks who dreamed up the solution. But with all of that glory comes new design and operation elements that may have been introduced. This isn’t a bad thing. It is just different. The magic of virtualization didn’t excuse the requirement of needing to understand the design and operational considerations of the new paradigm. The same goes for implementing host based caching in a virtualized environment. Implementing FVP is simple and the results can be impressive. For many, that is about all the effort they may end up putting into it. But there are design considerations that will help maximize the investment, and minimize false impressions, or costly mistakes. I want to share what has been learned against my real world workloads, so that you can understand what to look for, and possibly how to get more out of your investment. While FVP accelerates both reads and writes, it is the latter that warrants the most consideration, so that will be the focus of this post. Performance delta between your flash tier, and your storage tier. Most know by now that to guard against any potential data loss in the event of a host failure, FVP provides redundancy of write-back caching through the use of one or more peers. The interconnect used is the vMotion network. While FVP does a good job of decoupling the VM’s need to wait for the backing datastore, a VM configured for write-back with redundancy must acknowledge the write I/O of the VM from it’s local flash, AND the one or more peers before it returns the write ACK to the VM. What does this mean to your environment? More traffic on your vMotion network. Take a look at the image below. In a cluster NOT accelerated by FVP, the host uplinks that serve a vMotion network might see relatively little traffic, with bursts of traffic only during vMotion activities. That would also be the case if you were running FVP in write-back mode with no peers (WB+0). This image below is what the activity on the vMotion network looks like as perceived by one of the hosts after the VMs had write-back with redundancy of one peer. In this case the writes were averaging about 12MBps across the vMotion network. You will see that the spike is where a vMotion kicked off: The spike is the peak output of a 1GbE interface; about 125MBps. 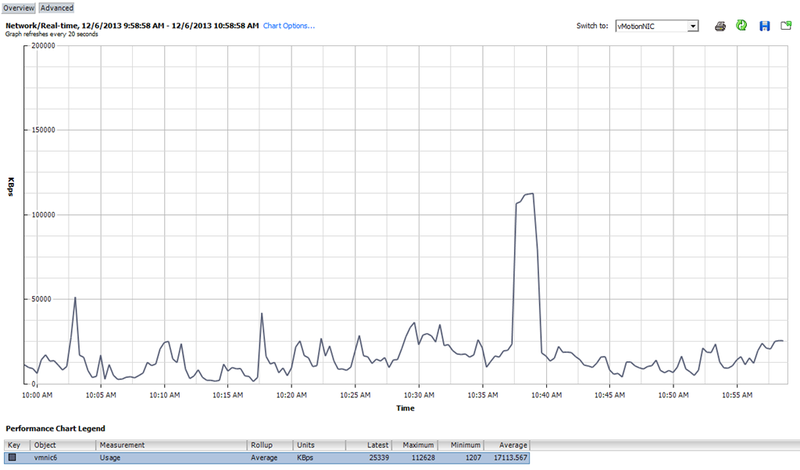 Is this bad that the traffic is running over your vMotion network? No, not necessarily. It has to run over something. But with this knowledge, it is easy to see that bandwidth for inter-server communication will be more important than ever before. Your infrastructure design may need to be tweaked to accommodate the new role that the vMotion network plays. Redundant write back caching with FVP will be using network connectivity (via vMotion network) for every single write that occurs for an accelerated VM. Redundant write back caching writes are multiplied by the number of peers that are configured per accelerated VM. The write accelerated I/O commit time (latency) will be as fast as the slowest connection. Your vMotion network will likely be slower than the local bus. A poor quality SSD or an older generation bus could be a bottleneck too. vMotion activities enjoy using every bit of bandwidth it has available to it. VM’s that are committing a lot of writes might also be taxing CPU resources, which may kick in DRS rules to rebalance the load – thus creating more vMotion traffic. Those busy VMs may be using more active memory pages as well, which may increase the amount of data to move during the vMotion process. Lets run through a simple scenario to better understand the potential impact an undersized vMotion network can have on the performance of write-back caching with redundancy. The example is addressing writes only. 4 hosts each have a group of 6 VM’s that consistently write 5MBps per VM. Traditionally, these 24 VMs would be sending a total of 120MBps to the backing physical storage. When write back is enabled without any redundancy (WB+0), the backing storage will still see the same amount of writes committed, but it will be in a slightly different way. Sequential, and smoothed out as data is flushed to the backing physical storage. When write back is enabled and a write redundancy of “local flash and 1 network flash device” (WB+1) is chosen, the backing storage will still see 120MBps go to it eventually, but there will be an additional 120MBPs of data going to the host peers, traversing the vMotion network. When write back is enabled and a write redundancy of “local flash and 2 network flash devices” (WB+2) is chosen, the backing storage will still see 120MBps to it, but there will be an additional 240MBps of data going to the host peers, traversing the vMotion network. The write-back redundancy configuration is a per-VM setting, so there not necessarily a need to change them all to one setting. Your VMs will most likely not have the same write workload either. But this is to illustrate the point that as the example shows, it is not hard to saturate a 1GbE interface. Assuming an approximate 125MBps on a single 1GbE interface, under the described arrangement, saturation would occur with each VM configured for write-back with redundancy of one peer (WB+1). This leaves little headroom for other traffic that might be traversing that network, such as vMotions, or heartbeats. Fortunately FVP has the smarts built in to ensure that vMotion activities and write-back caching get along. However, there is no denying the physics associated with the matter. 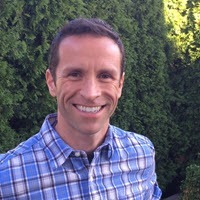 If you have a lot of writes, and you really want to leverage the full beauty of FVP, you are best served by fast interconnects between hosts. It is a small price to pay for supreme performance. FVP might expose the fact that 1GbE not be ideal in an accelerated environment, but consider what else has changed over the years. 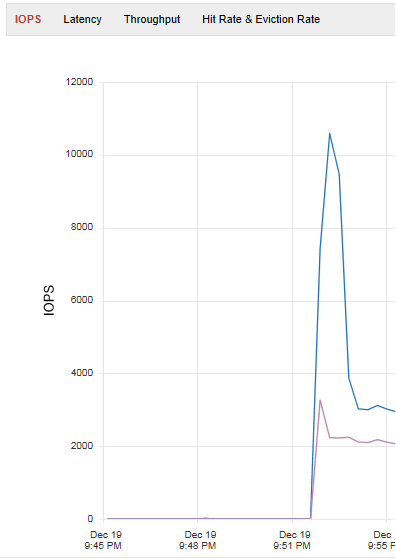 Standard memory sizes of deployed VMs have increased significantly (The vOpenData Public Dashboard confirms this). That 1GbE vMotion network might have been good for VM’s with 512MB of RAM, but what about those with 4, 8, or 12GB of RAM? That 1GbE vMotion network has become outdated even for what it was originally designed for. One characteristic unique with any type of write-back caching is that eventually, the data needs to be destaged to the backing physical datastore. The server-side flash that is now decoupled from the backing storage has the potential to accommodate a lot of write I/Os with minimal latency. One may or may not have the backing spindles, or conduit large enough to be sending your write I/O to the backing physical storage if this high write I/O lasts long enough. Destaging issues can occur on an arrangement like FVP, or with storage arrays and DAS arrangements that front performance I/O with flash that get pushed to slower spindles. Knowing the impact of this depends on the workload and the environment it runs in. 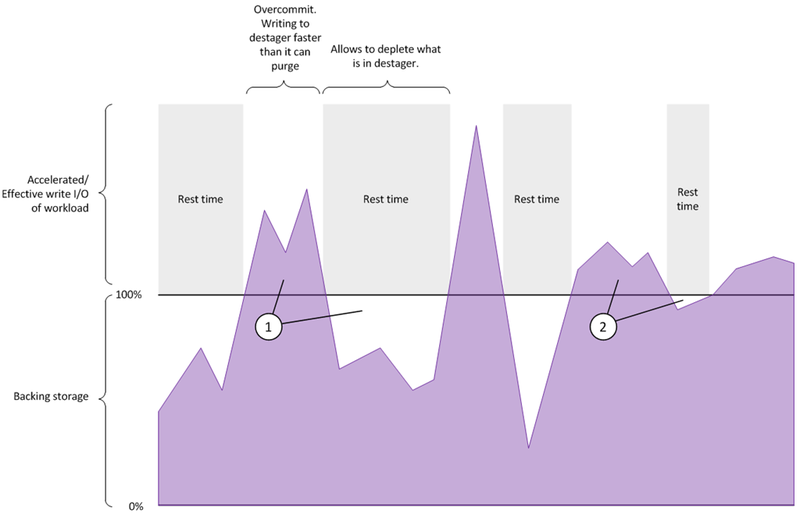 If the duty cycle of the write workload that is above the physical storage I/O limit allows for enough “rest time” (defined as any moment that the max I/O to the backing physical storage is below 100%) to destage before the next over commitment begins, then you have effectively increased your ability to deliver more write I/Os with less latency. If the duty cycle of the write workload that is above the physical storage I/O limit is sustained for too long, the destager of that given VM will fill to capacity, and will not be able to accelerate any faster than it’s ability to destage. Huh? Okay, a picture might be a better way to describe this. The callouts below point to the two scenarios described. So when looking at this write I/O duty cycle, there becomes a concept of amplitude of the maximum write I/O, and frequency of those times in which is it overcommitting. When evaluating an environment, you might see this crude sine-wave show up. This write I/O duty cycle, coupled with your physical components is the key to how much FVP can accelerate your environment. 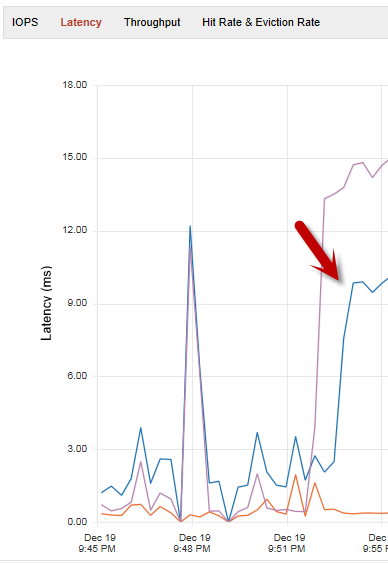 This will have an impact on the effective latency, shown below (blue line). While the destager is full, it will not be able to fulfill the write at the low latency typically associated with flash, reflecting latency closer to the backing datastore (purple line). Many workloads would never see this behavior, but those that are very write intensive (like mine), and that have a big delta between their acceleration tier and their backing storage may run into this. The good news is that workloads have a tendency to be bursty, which is a perfect match for an acceleration tier. In a clustered arrangement, this is much harder to predict, and bursty can be changed to steady-state quite quickly. What this demonstrates is that if there is enough of a performance delta between your acceleration tier, and your storage tier, under cases of sustained writes, there may be times where it doesn’t have the opportunity to flush enough writes to maintain it’s ability to accelerate. My recommendations (and let me clarify that these are my opinions only) on implementing FVP would include. As you gain a better understanding of the behavior of these workloads, introduce write-back caching to see how it helps the systems changed. Keep and eye on your vMotion network (in particular, those with 1GbE environments and limited physical ports) and see if one ever comes close to saturation. Other leading indicators will be increased latency on accelerated writes. Run out and buy some 10GbE NICs for your vMotion network. If you are in a situation with a total 1GbE legacy fabric for your SAN, and your vMotion network, and perhaps you have limits on form factors that may make upgrading difficult (think blades here), consider investing in 10GbE for your vMotion network, as opposed to your backing storage. Your read caching has probably already relieved quite a bit of I/O pressure on your storage, and addressing your cross server bandwidth is ultimately a more affordable, and simpler task. If possible, allocate more than one link and configure for Multi-NIC vMotion. At this time, FVP will not be able to leverage this, but it will allow vMotion to use another link if the other link is busy. Another possible option would be to bond multiple 1GbE links for vMotion. This may or may not be suitable for your environment. So if you haven’t done so already, plan to incorporate 10GbE for cross-server communication for your vMotion Network. Not only will your vMotioning VM’s thank you, so will the performance of FVP.